Newly married yoga instructor Kate Davidson feels stuck in low-energy limbo, despite her high-energy life. 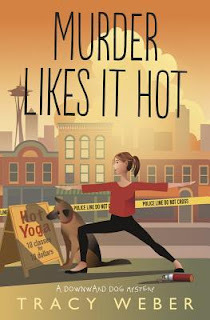 She's trying to conceive a child, keep her studio afloat now that the ultra-cheap Some Like It Hot Yoga studio has opened across the street, and start a yoga program at a local resource center for homeless youth. When a center employee is found dead, Kate sets aside her fertility and financial woes to delve into the world of teenage homelessness. While digging for clues with her German shepherd Bella, Kate discovers that family can be formed by bonds stronger than shared DNA, and she must defend it at all costs. Yoga instructor, Kate Davidson, is adjusting to married life. The one thing that would make it perfect is having a child. Unfortunately, it’s been difficult for her to conceive a child. Kate and her husband, Michael, are considering other options. However, they are costly. As Kate and Michael deal with their personal life, other issues are thrown their way. A new competing yoga studio is offering very cheap classes that Kate cannot match. The last thing they need is for Kate’s yoga studio to lose money. She is offered an opportunity to lead a yoga class at a local center for homeless teens and she accepts. To her horror and shock, Kate discovers a dead body at the center. The clues are pointing towards one of the teens who Kate has gotten close to. She’s not going to let this girl take the rap for a murder she didn’t commit. Kate has her work cut out for her but with the help of her friends, her dog Bella and a pair of pet rats, she is determined to get to the truth. This is the 6th book in the Downward Dog Mystery series and I think it could be the best. I have read all but one book in the series (which I will eventually get to), and I’ve grown so attached to these characters. The book is filled with emotion surrounding Kate’s personal life as well as mystery that surrounds the teen center. The mystery storyline is contained in this one book. You don’t need to read the previous books to solve it, but I think it makes a much better reading experience to start with book #1 and read how Kate’s character grows. I felt as if I was visiting an old friend. I read through this book quickly. It was a wonderful way to spend a long weekend. I’m so hoping there will be more books in this series. Disclosure: I borrowed the e-book from my library. I was not required to write a positive review. All opinions expressed are my own. I have several earlier books in this series but haven't read them. This sounds really good and maybe a bit poignant which is unusual for a cozy. I've been into yoga lately so the yoga angle is really appealing.